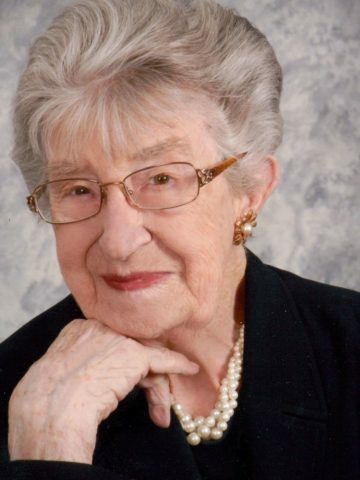 The earthly life of Lucille “Lucy” Sonja (Watson) Pulley, 91, ended on February 27, 2018, where she was surrounded by her loved ones at her home in Hendersonville, Tenn.
Mrs. Pulley was born in New York City on January 13, 1927, but spent most of her early life being educated in a boarding school in France. In 1941, she fled her beloved France during the outset of World War II on board the USS Siboney and returned to New York, bringing with her only a few prized possessions. In New York, she was enrolled in The Dalton School, one of the top private schools in the country, where she graduated in 1945. In 1950, Mrs. Pulley married the greatest and only love of her life, Lt. Col. John H. Pulley, Jr., who was so smitten with her that he proposed during their first date. Mrs. Pulley joined St. Joseph of Arimathea in Hendersonville, Tenn., in 1965, and was very involved with the church until her death. This included past service as an altar guild and long-time service in the Daughters of the King. Mrs. Pulley was a career dressmaker, a skill that she learned from her mother and her uncle Jean Louise, an Academy Award-winning costume designer. This craft took her many places, including Los Angeles where, among other roles, she was a set dresser for Columbia Pictures. Her career path also introduced her to many people, and she designed and created dresses and clothing for many of Hollywood’s and Music City’s elite, and designed dresses for multiple Miss America and Miss Tennessee pageant contestants. While she had many brushes with fame, Mrs. Pulley’s pride and primary focus was always her family whom she loved deeply. She is survived by her children MSgt John S. Pulley (Kaoru), Susan M. Hall and Scott Pulley; and grandchildren, Carrie Clouse Illyes (Ryan), Kelsey Anna Pulley, SMSgt John H. Pulley (Nami), and Lanny K. Pulley (Grace); and great grandson Calvin L. Pulley. Her husband, John, precedes her in death, along with her parents Albert and Marguerite Watson, and brother Richard Watson. Mrs. Pulley will be cremated. Visitation will be held at 11 a.m., with the service at noon and a celebration of life to follow on Saturday, March 3, at St. Joseph of Arimathea in Hendersonville. In lieu of flowers, the family requests that donations be made in Mrs. Pulley’s honor to St. Joseph of Arimathea Episcopal Church,103 Country Club Dr., Hendersonville, TN 37075. My girls and I were so fond of Ms.Pulley! We went to see her many times for prom dress alterations,etc. and enjoyed seeing the beautiful costumes/dresses she made! She was such a sweet lady!